We left the ship at 9am and got back at 10pm. Yes, I can hear you all saying, we had an Ellen day! We slept pretty well, staying in bed until 7. Breakfast on the ship was good, a standard buffet. Around 9 when the buses were loading for the city tour, we headed out on our own. We had too much to do to ride around on a bus for half the day. 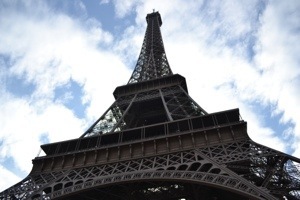 Our first stop was the Eiffel Tower. It was cold this morning, but the sun was breaking through the clouds. We had to wait for tickets, but it moved pretty fast, and we were then up to the top. 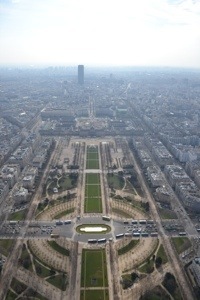 There was a great view from the top, but it was too cold to stay outside so high for long. 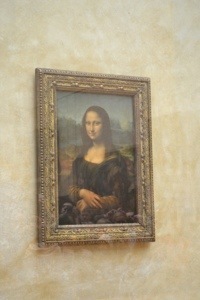 Next stop was the Louvre. We took the subway a few stops and walked over the Seine. Again, the museum card saved us an hour of standing in line to get tickets. 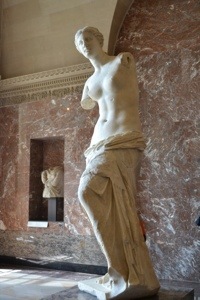 We were only really here for the biggies, so we beelined to the Mona Lisa and Venus de Milo. Maybe trite, but worth it. We stopped at Sanseveria on Rue de Rivoli for lunch. Ellen had a croque Monsieur, and I had the most beautiful tomato and mozzarella plate ever. I think it was the peeled tomatoes and salt on the basil that did it. We then made a little shopping excursion, so Ellen could pick up a Thomas Sabo bauble or two. No trip to Paris would be complete without it! Next was our last museum for Paris, Musee de l’Orangerie. Some fantastic Renoir and Monet paintings, topped by Monet’s Water Lillie’s that complete two round rooms with surrounding paintings. I had wanted to stroll down the Champs Élysées when we were coming back from Switzerland a few years ago but we timed it perfectly with the last stage of the Tour de France and ran screaming from the crowds. So this time there were just shoppers, no cyclists. 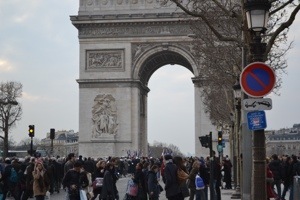 Well, there was some sort of parade going through the Arc de Triomphe, but that was okay. Last stop of the night was dinner. Ellen found a traditional Fench restaurant in a guidebook, and well, that was enough. Se we went to Dominique Bouchet. We each had the leg of lamb with carrots and puréed potatoes. We were given a chef’s treat of asparagus mousse, which was really good. Following dinner we declined dessert, but ended up with a tray of a truffle, marshmallow, caramel and cookie. Just the right amount, and Ellen just loves when there are these extra touches as part of a meal. 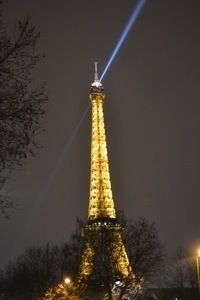 We metro’d back to the Eiffel Tower, and walked to the ship. 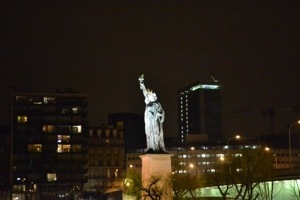 The tower and the Statue of Liberty were lit, a pretty way to see Paris for the last night until we come back on Saturday night. Two end notes: I made some of the pictures smaller than I’d like, and that is because of the slow Internet on the ship. And I am observing Passover by EDT since that’s where I’ll be when it ends. So include me in abstentia in your Seders tonight. I brought matzah and other supplies so there is no danger of my starving. 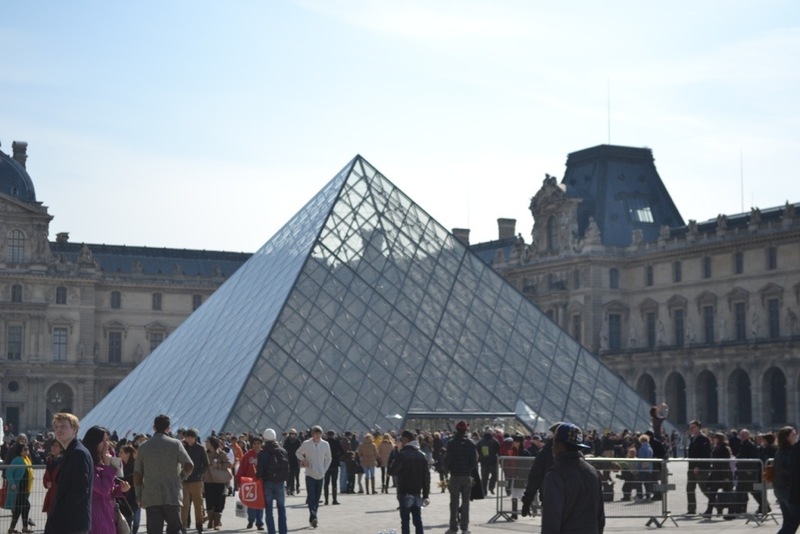 This entry was posted on Monday, March 25th, 2013 at 4:54 pm	and tagged with Eiffel Tower, l'orangerie, Louvre, Paris and posted in France, Paris. You can follow any responses to this entry through the RSS 2.0 feed. My gosh – that IS a gorgeous tomato-mozzarella salad.